For many, old-school arcade game sits at the intersection of solace and skill. They say if you check the pinball machines in select bars around town, you'll find the monogram "MIL" claiming the high scores. These initials belong to Mike Lund—the "I" stands for Iceman, he says. Lund's 9-to-5 is in real estate, but when he's not on the clock, he's likely putting in hours on a pinball machine, either his own or one at a favorite haunt. Though he downplays any prolific presence in Salt Lake City's public pinball machines, other regular pinballers attest to it. "I've seen him in a lot of machines," says Nels Evenson, a recent Washington state transplant. "Some places, he's in all of them." Lund is selective about the bars he patronizes—always preferring dives. "There's plenty of good players out there," he says, adding "it depends on who goes to what bar." Last Saturday, midnight approaching, Lund squares off against an avuncular Sandy resident and Mountain Dew addict named Dan Newman. 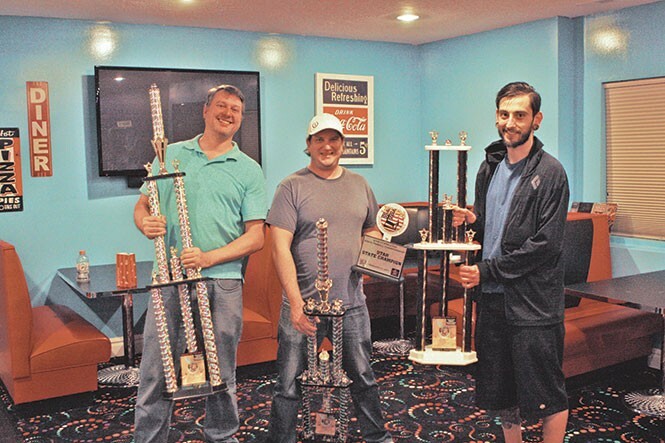 Both men were undefeated in the state's first championship tournament held in the basement a palatial Bluffdale home, where pinball collector Blake M. has amassed 21 machines. Blake's collection, which includes a handful of non-pinball arcade-style games—all of which were neglected on this night—is so impressive that he asks not have his last name printed for fear of theft. The machines emit a cornucopia of arcade sights and sounds. 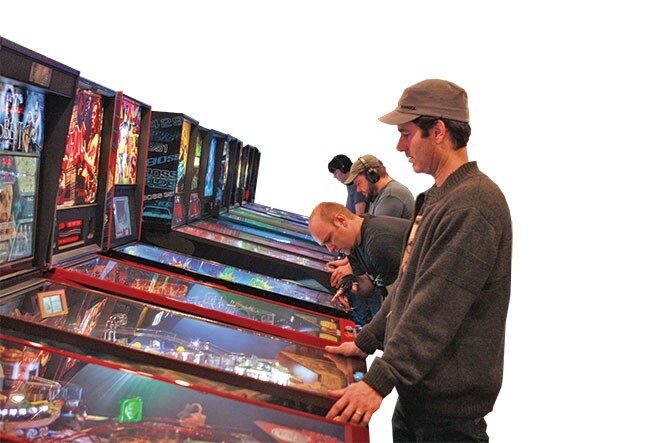 The tourney was the convergence of Utah's top pinball players. (A couple players in the Top 16 were unable to attend, thus forfeiting their spots.) The 16-bracket, single-elimination tournament was underway. One winner will move on to represent Utah at the International Flipper Pinball Association's national championship tournament. To say these players love to play pinball is a gross understatement. They talk strategy and design, they trawl online classifieds looking for used machines, they post on pinball forums, they watch YouTube tutorials. One imagines their fingers twitch at night as they dream. They listen to podcasts, such as locally produced "The Pinball Podcast." Jeff Rivera co-hosts the program—it's topped a few thousands subscribers as it nears its 100th episode—with a friend from Albuquerque, N.M.
"The main format of the show is what we've been doing in pinball, and we have listeners who write in," he says. "But there's also news. There are new games coming out all the time and updates." These are the folks who can tell you, for example, that there is a Monopoly pinball machine at a truck stop in Beaver, Utah. Kevin and Allison Hill, a younger couple with leading-role good looks, were lent some sage advice by Allison's father: When getting to know a new person, wait until at least the fifth get-together before bringing up pinball, so you don't freak them out. A sign taped to Blake's front door reads, "Please come in. The nerd fest is in the basement." Meant in jest, the message isn't wholly accurate. The players in Utah's tournament span the social spectrum, and based on appearance alone, you'd have no idea many took part in this scene. Not too far back in history, pinballers were associated with unruly hooligans. Outlawed for many years in some U.S. cities, pinball was viewed as a vice of degenerate gamblers. Around 1942, New York City Mayor Fiorello LaGuardia staged a hardline publicity stunt, smashing confiscated machines with a sledgehammer. In the mid-'70s, a man named Roger Sharpe demonstrated to New York officials that pinball was a game of skill, not luck, and the ban was lifted. The popularity of pinball has rollercoastered and, over the past five years, it has experienced a resurgence. Like many niche hobbies, ardent members have formed a community connected by their obsession. But their unbridled enthusiasm is endearing and infectious. For the layman, the goal of pinball is to keep the ball alive—that is to propel it up into the machine, watch the steel orb dance around in the lights and then block it from falling through the gap between the flippers. With a little more practice, a player will begin to take aim at its features—the ramps, the targets—not to just play defense, but send the ball where they want it to go. But an experienced player on any modern machine will figure out the game within the game—"modes" as they're sometimes called. These reflect the ingenuity of the designer, and the modes are almost always themed after a movie, TV show or other pop-culture landmark. It takes a skilled player to be able to read the machine. Blake produces a flow chart for a Wizard of Oz arcade game that reveals a complex web of modes. "Every machine has a story or a genre," pinball buff Steve Kondris says. "Simpsons is a good example. It's known as being a very broad, complex machine because there's a whole bunch of story modes. ... In one game mode, it's Homer's Day. There's a series of shots, and you have to hit them in the right order." The player, Kondris explains, will direct the ball first to the power plant section of the machine, then to the bar, then to the garage and finally send the ball to the couch, where Homer retires for the night. In competitive pinball, knowing whether your opponent is familiar with a certain game is an advantage. These players pick their machines deliberately. As Saturday turns to Sunday, all but four players have wrapped up their competitive games. Most called it a night an hour or more earlier and left. Lund and Newman are on a game in a smaller side room that houses six pinball machines. The match for third place is in progress in the main room between Kelly Thomson, a steely eyed BYU grad who built his own pinball machine, and Levi Montoya—the PBR-packing bartender with tattoo sleeves—down both arms and one leg. Thomson was the No. 1 seed entering the tournament, and he's known to play with a disciplined, controlled style. But he's down a game in the best-of-seven match to Montoya, a "fluid" player. Montoya's body jerks spasmodically when he presses the flipper buttons, and his right leg kicks back like he's pushing an invisible skateboard. The winner of this match with take home a third-place trophy and a nice cash consolation prize—$50, someone says. Tonight's victor will earn $100, but the more coveted prize is entry into the IFPA National Pinball Championship tourney in Dallas next month. Utah has never had a state championship representative at nationals, and Lund and Newman want to be the first. Although only one player can rep Utah at the national championship, there are more venues where pinballers can test their skills. 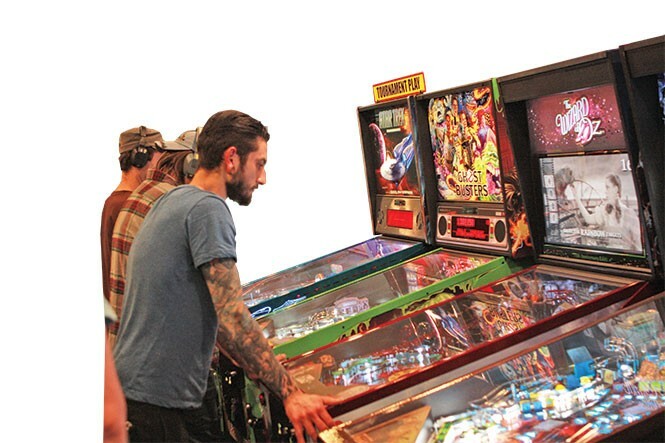 A few locals will head to Pittsburgh in July to compete in aptly titled "Pinburgh"—a massive world-renowned pinball marathon. It's an open-invitation competition run by Kevin Martin, owner of hundreds of pinball games. "He started buying every single machine," Newman says. "Once a year, he'll have a tournament and he'll open up that collection." When tickets go on sale, there is a mad rush from enthusiasts around the world to snag one. Riverton resident Troy Piantes managed to get three in a 20-minute window before the 650 tickets were gone. He is bringing his wife, Helena, and Newman. Piantes says he's building up his pinball stamina for what could be 16-hour days at Pinburgh. Locally, the Salt Lake Area Pinballers (SLAP) runs tournaments and leagues throughout the year. Players can sign up to participate in an upcoming tournament at an arcade in Springville on March 25. These events earn players points that will determine the ranking for next year's state championship. Tonight, the last game of the championship is being played on Ironman, an unforgiving game. "It will throw that ball right down the middle," Lund says. But he dominates his second ball. The few in the room see the writing on the wall as Lund tames the machine with ungodly precision. Newman prematurely congratulates his opponent before either plays their third ball. When the match ends, Lund accepts his victory without pomp. But it takes a moment for him to leave the machine, which has just registered a new high score. And before Lund does anything else, he needs to commemorate the event by entering "MIL," his ubiquitous initials.